Here’s another amazing member of our staff. There are so many great people who make up Hubbard Hall and I hope you’ll enjoy meeting them each week. Years ago when I was Producing Artistic Director and CEO of Young Playwrights’ Theater in Washington, DC, I was lucky enough to work with a brilliant and brilliantly kind bookkeeper named Leland Larson. 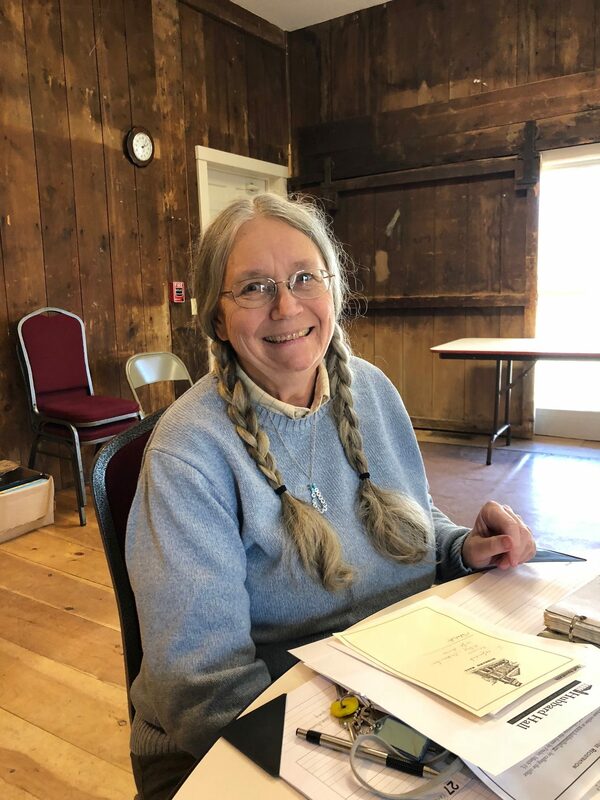 When I arrived at Hubbard Hall five years ago, I felt like lightning had struck twice, as I found another kindred financial spirit in Anne Dambrowski, our wise and wonderful bookkeeper. Anne is patient, kind, funny – and anxious in a good way – anxious that we have enough money to serve our mission. And that our people are taken care of, from audiences to artists and especially staff. She’s quick with a joke but also doesn’t suffer fools or foolishness. She’s one you want on your team. With her on your side, you feel like you can’t lose. What do you do at HH? My main job at the Hall is Bookkeeping: which includes depositing donations from our wonderful individual and corporate supporters, paying bills, sending invoices to those who forgot to pay for their classes or promised to take ads in the playbill, or are sharing some expenses for the upkeep of the property; processing payroll for staff and teachers, sending tax payments to the Federal government twice weekly, sending state tax withholding whenever the liability reaches $700, filing federal and state payroll reports quarterly, keeping track of various restricted funds (scholarship and grant funds as well as special small accounts where we keep money that has been raised for things such as dance costumes, the community garden, and upkeep of the community bread oven). Other stuff I do is fielding phone calls to take ticket orders and answer various questions about classes, shows and upcoming events. Helping other staff members with IT questions. If I can’t help. I contact Wilson Pratt at Battenkill IT. I meet with David Snider, Executive and Artistic Director once each week to update him on the finances of the hall and decide what bills we can pay. What are your biggest challenges at HH? There is never enough money. We are trying to accomplish full time work for a business with a half-million dollar budget with a part-time staff and some very dedicated volunteers. What else should people know about what you do? I have a life outside of my Hubbard Hall job. I do bookkeeping for 5 other businesses – 2 non-profit and 3 for profit. For fun I garden and I am a competitive saber fencer. Fencing is something I picked up at Hubbard Hall about 15 years ago. The Hall is a wonderful place that local people can congregate to share experience. I particularly like the cello seminars/concerts from Music from Salem. Even though we always say it is a place where magic happens, the programming does not happen by magic. It takes hard work and attention from many people. And community support. AND . . . this is the bookkeeper speaking . . . money.